An extended version of the iPhone 7 video that came out a few days ago is now available for your viewing pleasure. The video shows a comparison in the hardware design between the iPhone 7 and iPhone 6s. Additionally, a number of photos are also available to illustrate the differences a step further. As you probably know by now, the main differences between the iPhone 7 and current generation are the lack of a 3.5mm headphone jack, redesigned antenna lines and a seemingly larger camera bump at the back. 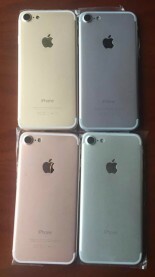 Finally, a new photo confirms the four iPhone 7 color options, which surfaced last week. Apple will offer the phone in four hues - Silver and Space Grey, Gold and Rose Gold. There's plenty of time until September when Apple is expected to announce the iPhone 7, so we'll be in for a lot more leaks in the meantime.